Everyone who has ever sent an email in sales purposes has had only one mission in mind – to get a response. Once you do that, once you manage to interest the recipient to email you back, it all falls down to your skills as a salesman to close the deal. Although this seems pretty straight-forward in theory, getting a response has never been an easy thing. This first step is always the hardest. If you’ve ever used email to sell something, you know that the tiniest of details can mess up your chances for engaging potential clientele. Everything from the content within the body of the email, time when it was sent, to the length of your subject line can affect the open and click through rates of your messages. Imagine if you could know all the details behind your emails? Imagine if you could understand what sells and what doesn’t? Wouldn’t it be great if you could know when to engage your prospects and how to create standardized email templates that actually work? Just think what it would be like if you had a deeper understanding on how to maximize your email and close more and more deals, by investing far less energy and time into writing actual messages? Try using ToutApp. 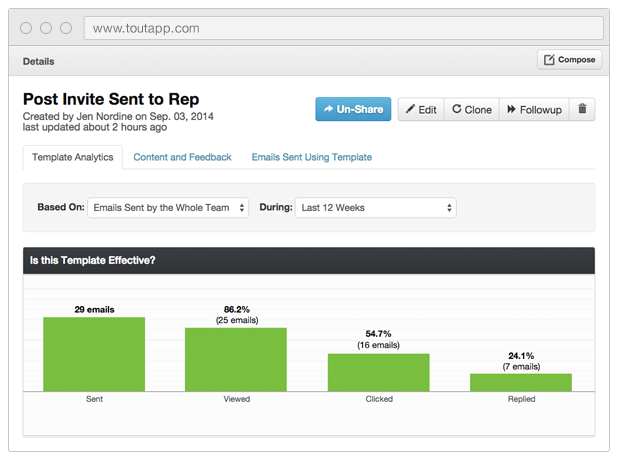 When it comes to email, ToutApp is the complete sales acceleration solution. Whether you are a sales manager or a sales rep, this tool will provide you with everything you need in order to standardize your work, maximize your leads and get a deeper understanding on how to increase your overall productivity. 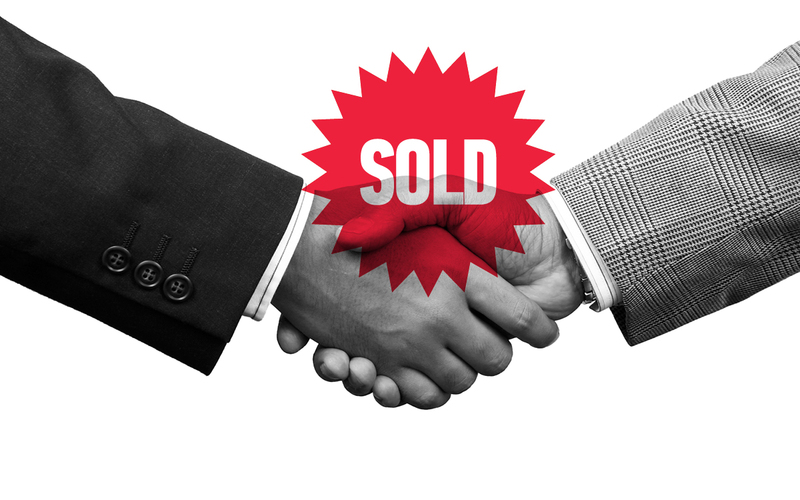 This tool will give you everything you need in order to understand what to do next to close deals faster. 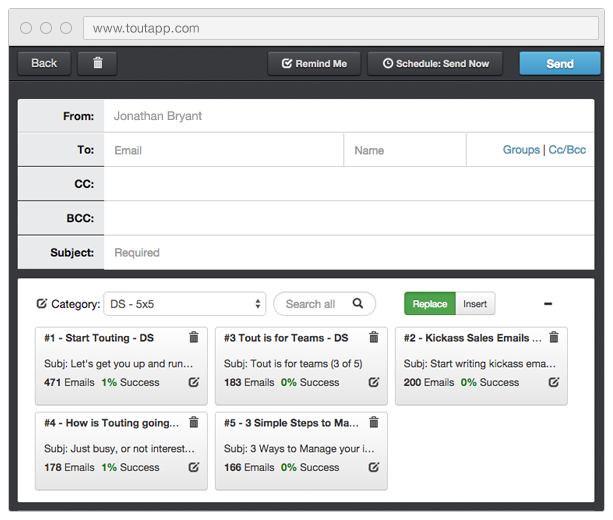 ToutApp will help you figure out how to streamline repetitive tasks and get the maximum out of your sales team, so that you can spend more time selling. 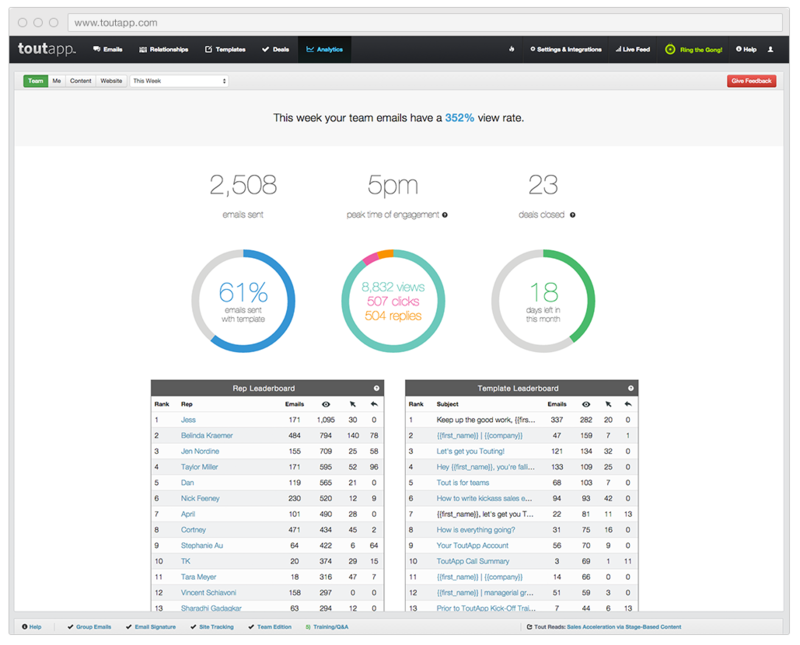 Just like Yesware, ToutApp comes with its own Salesforce integration, and it focuses on email tracking, templates and analytics. With these three combined elements, you’ll be able to track and analyze your sales prospect like never before, follow up on real time email activity, schedule messages, A/B test your content and figure out which frameworks work better than others and easily update Salesforce from anywhere on the web. When I send a certain sales email, I want to know if and when has it been read. I want to know every single detail about it, so I can fully understand if I should give up on a specific lead or keep trying. Let’s think about just email tracking right now. If you send a certain email and you know that it has been read, but you haven’t received any feedback – something isn’t working right. If a recipient has viewed your content, for example, three times today and still hasn’t sent you anything back – that means that he is probably still making up his mind and you should try to send a follow-up message in order to help him decide in your advantage. 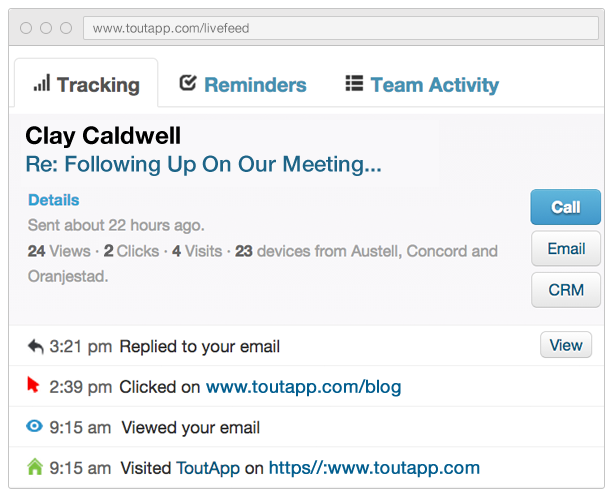 These are just some of the basic situations where ToutApp’s tracking system comes to shine. The greatest feature of this app is definitely its Live Feed, which tells you when people are reading your email, what they’re clicking on, and what page of the attachment they‘re currently on – all in real time! Just like I wrote above, this software can also be used for website and attachment engagement tracking. Sales people need to know how their leads are reacting, whether they’re reading, deleting, forwarding or just hovering over their emails. This kind information unmasks the person behind a specific email address and gives the sales reps an entity that they can later on target based on its behavior. ToutApp’s tracking and analytics system is pretty easy to use. Its intuitive interface gives the user a clear picture of what is where, and how to find what he’s looking for. It really takes no time to get familiar with ToutApp’s interface and figure out how everything works. When writing about specific targeting, there is nothing better than giving your leads a feeling like you see them as individuals, and not just potential clients. In order to do that, you have to invest a certain amount of time getting to know them, so you could later on construct that personal approach and make them feel comfortable in doing business with you. The problem is that you haven’t got really time for that. Many sales reps are chasing multiple leads at the same time, and their job requires them to send repetitive emails all day long. They don’t have the luxury to write personalized emails for everyone that they are trying to reach. ToutApp has a solution for this problem, as well. 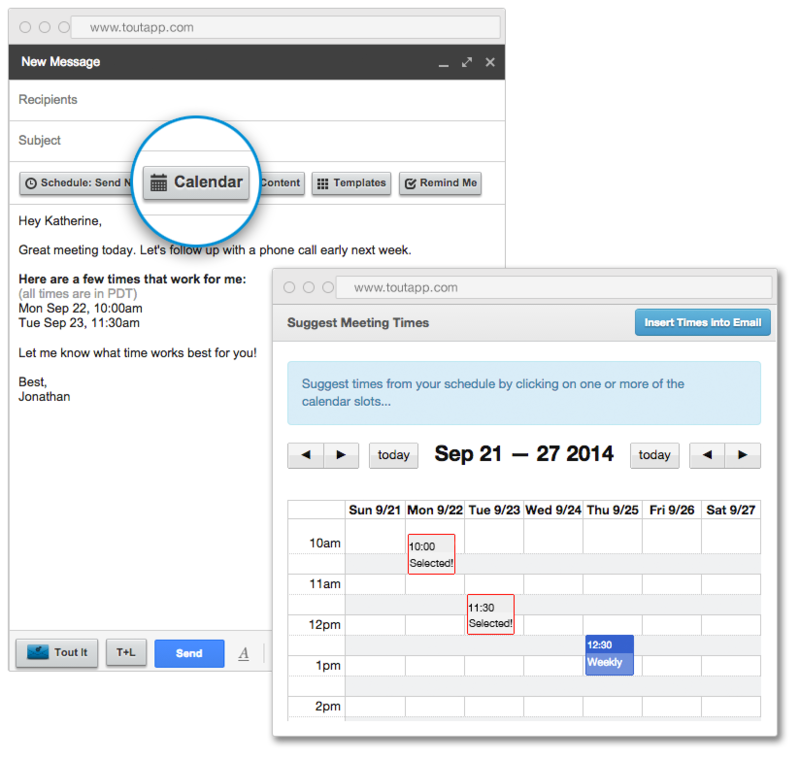 This app offers its users quick-to-use, easy-to-create and easy-to-edit email templates that they can fill in with additional tags, based on contact information or custom fields from the CRM. To construct a new template, you need to create a certain text, give it a name and save it. When another situation requires a similar email as one that you’ve already “templated”, all you need to do is find it in your “saves”, tweak it and send it flying. Say goodbye to copy-pasting and editing from your sent folder or backing up certain frameworks on various other channels. The cool thing about this feature is that it allows template sharing and template collaboration as well. You can see which templates are performing the best and you can share them with your entire team, in order to maximize your sales. This feature also gives you the opportunity to ring the virtual sales gong and share the good news with your fellow coworkers when you made a new sale. Finding a right time to send an email is probably one of the most important things in this business. If a certain person is mostly reading your emails on their phone, that means that you’re probably trying to communicate with him at a wrong time, when he is on the go. You don’t want that. You want your reader’s full attention. You want him to sit down and really focus on your words. ToutApp’s scheduling feature can help you with that. After using the above mentioned tracking and analytical system to find out when is the best time to engage a certain party, click the “Schedule: Send Now” button, wait for the additional menu with three columns to appear, and choose the time and date when you want to send your email. Although it comes in three different forms, as a stand-alone app, Outlook add-on and as a Gmail extension, all these version suffer from the same thing- its unattractive design. I’m a person who spends a lot of time in Gmail, and I really hate it when a certain new interface is being introduced to me by force. If it’s already called an extension, I want it to look like it’s a part of a familiar interface, not a whole new thing. ToutApp is a paid service that comes with a free 14-day trial period. It comes in three packages, professional, team and enterprise, which I personally think are a bit expensive, comparing to Yesware and Boomerang who share the same features. All in all, to cut things short, ToutApp is a cool software that does what you need it to do. The guys from ToutApp are constantly thinking about the future, and they’ve just released an update on their analytics platform. Conversing with them, I’ve got a clear picture that their primary mission is to empower sales reps with sales software that will truly help them close more deals and be as proactive as possible. If you use email for sales or work with people who do, you should most definitely give it a try.